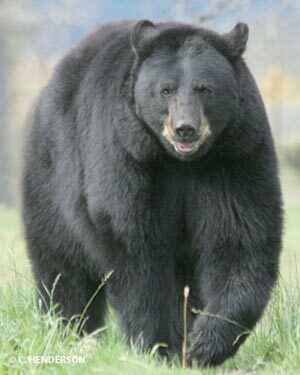 The black bear is the only species of bear in the state. They are generally restricted to forested areas. They follow their noses, and use their mental maps of the landscape to locate food sources, which are in a constant state of flux, from season to season and year to year. Black bears usually try to avoid people, but sometimes come in conflict with humans when they eat crops, destroy apiaries, or break into garbage cans and birdfeeders. General description: A large black (or sometimes brown) mammal with a large head, small eyes, erect ears, stout legs, and a very short tail. Bears have reasonable eyesight and hearing, and an exceptionally keen sense of smell (better than a dog). Length: Five to six feet long. Weight: Adults vary in weight from 150 (small female) to 500 (large male) pounds. Color: Black, dark or light brown (in Minnesota, less than 10% are brown). Sounds: Bears make huffing, snorting, and jaw-popping sounds when nervous or distressed, trying to repel intruders; cubs make humming sounds when nursing (an indication of being satisfied), and squealing when frightened or uncomfortable. 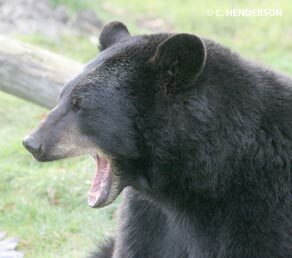 Black bears mate during May-July. The fertilized egg implants in November and the cubs are usually born in January, while the mother is denning. Newborn cubs do not hibernate, but the mother provides all their nourishment while she is hibernating. In Minnesota litters are most often of three cubs (average 2.6), which by mid-March weigh five or six pounds. They leave the den usually in early April and remain with the mother for 17 months, hibernating with her when they are 1 year old. Green vegetation in spring, turning to ants and ant pupae in June, a variety of berries in summer, and nuts (primarily acorns and hazelnuts) in autumn. Other bears, potentially wolves (while bears are hibernating), and people, who hunt bears for their meat and fur. Bears live in forests, swamps, and other areas with dense cover, but they also venture into clearings to feed. They are found mainly in the northern third of Minnesota, but range as far south as the interface between the forest and agricultural zones, where they utilize corn and other crops for subsistence. Bears often roam long distances in the fall, looking for food-rich areas (especially acorns) where they can fatten for winter. Although they all don’t move in the same direction, travel together, or even go on such excursions every year, they typically return to their summer home range to den, so this “fall shuffle”, as it is commonly called, is actually a true seasonal migration. Bears hibernate in their dens during winter, for as long as six or seven months, living off their stored body fat. During this time they do not eat, drink, urinate or defecate, but recycle body wastes and arouse in spring with little loss of muscle mass or strength.